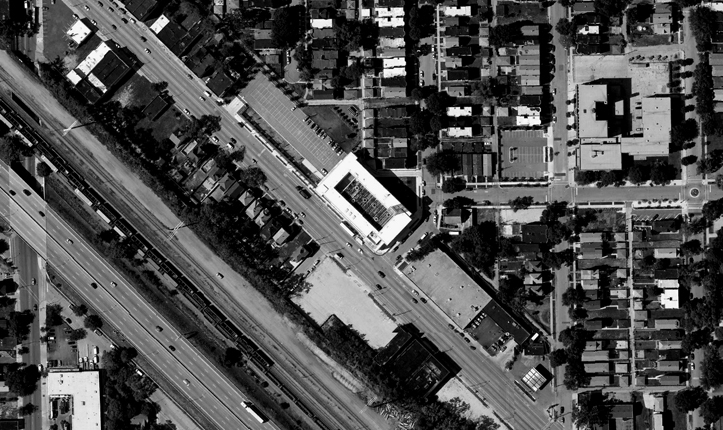 Like many economically-depressed urban areas, the Grand Crossing Neighborhood on Chicago’s South Side offered children little green space and few opportunities for after-school learning and entertainment. 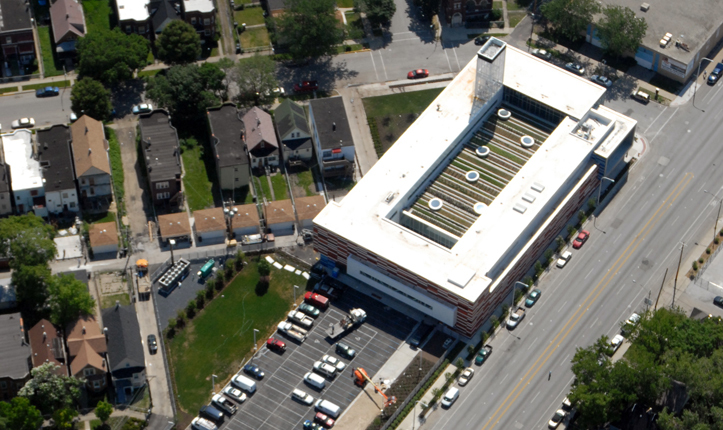 With the construction of the Gary Comer Youth Center and its rooftop farm, students now have a safe and welcoming environment where they can engage in educational and recreational programs. 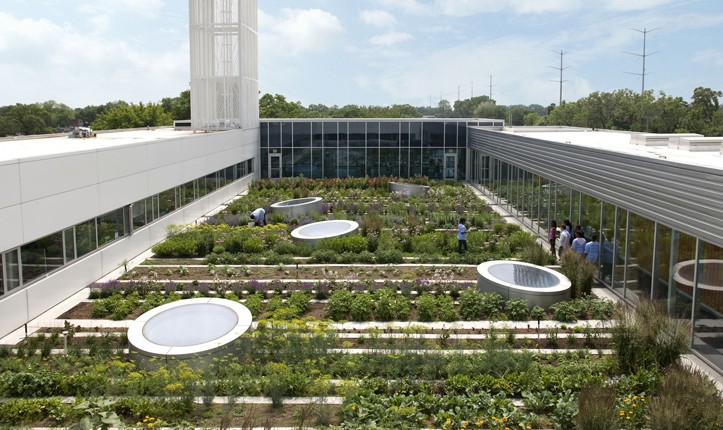 Situated directly above the Center’s gymnasium and cafeteria, the green roof includes 24-inches of soil topped with dozens of species of vegetation, including fruits, vegetables, herbs, and flowers. This provides significant insulation for the rooms below, reducing the amount of energy needed to heat and cool the building. 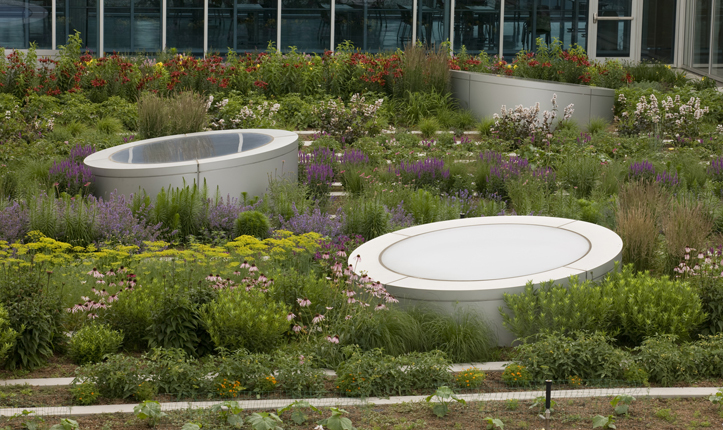 During heavy storms, the lush rooftop garden plots absorb rainwater, reducing the amount of runoff that reaches city storm drains. This helps alleviate problems associated with rapid stormwater runoff such as flash flooding and water pollution. The pathways, which also separate the garden plots, are made of recycled materials such as milk cartons and tire pavers. Using recycled materials reduces dependence on natural resources and minimizes deforestation. Surrounded on all sides by a ring of classroom buildings, the garden provides refreshing views for students circulating through the building. Circular metal structures dot the garden’s interior and serve as both artistic elements and functional skylights that allow natural light to pass into rooms beneath. 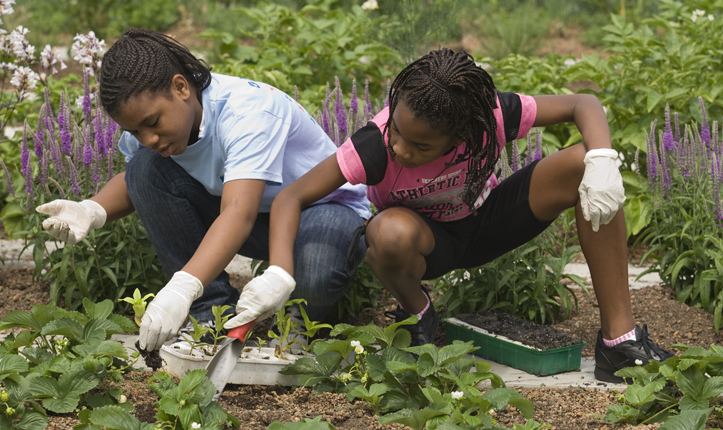 The rooftop garden, which is used to grow a range of fruits, vegetables, herbs, and flowers, has become a haven for student learning and urban agriculture. Here, students learn about nutrition, agriculture, and sustainability while engaging in all steps of the growing process from seed to harvest. The working garden provides also fresh produce for on-site cooking classes as well as meal preparation at the Center’s café and other local restaurants. Local food production is crucial for building self-sustaining communities. 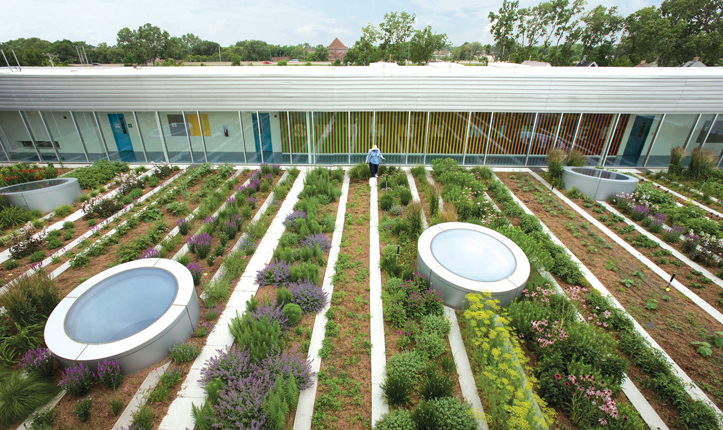 Located in a depressed area of Chicago’s South side, the Gary Comer Youth Center Roof Garden is an urban farm that produces more than 1,000 pounds of organic fruits and vegetables each year. 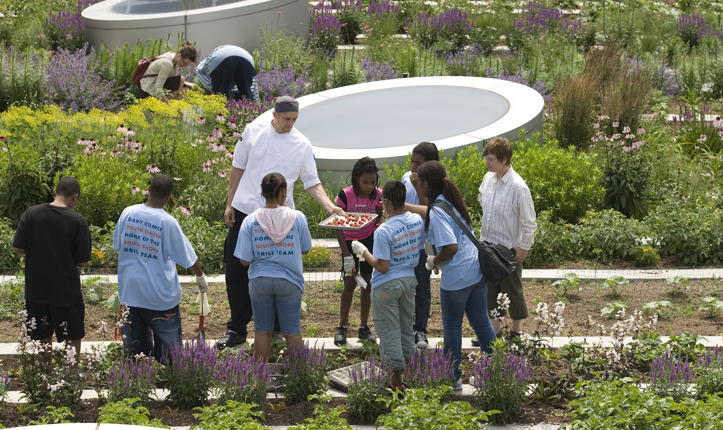 The Center’s rooftop garden provides students with hands-on extracurricular activities so they can learn about environmental sustainability and the nutritional benefits of fresh produce. 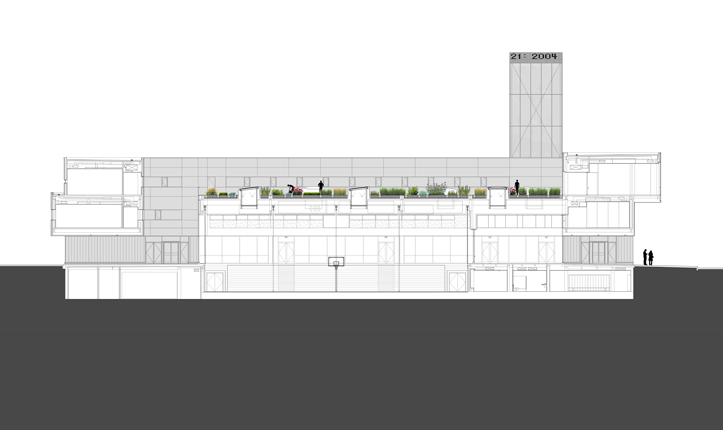 The Center’s café uses fresh produce grown on the roof to feed more than 175 students each day.